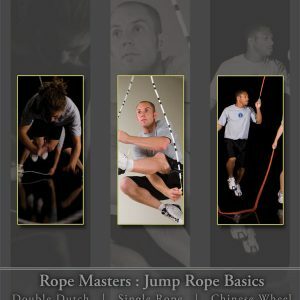 We now have full streaming access to this DVD and all our videos at jumpropesecrets.com. 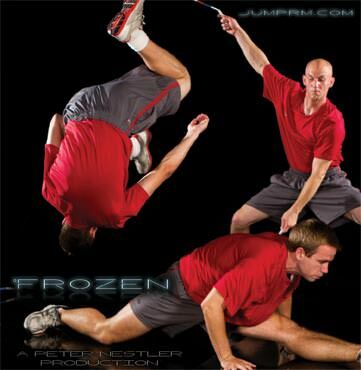 Frozen is NOT your average sports video. Featuring 4 of the best rope jumpers in the world, Frozen takes you inside their signature skills in ways never before captured on video. Witness every detail, every movement in crisp, super slow-motion. Join Peter Nestler along with Billy Jackson, Kaylee Couvillion and Lee Reisig (of Saltare from America’s Best Dance Crew) as they take you into the world of rope skipping in a way that begs to be experienced. Not only will you witness amazing skills, but also in an amazing way. With jumping done in water and smoke you’ll be blown away by what can be done with a rope. What would jumping be without music? Frozen features a brand-new, custom soundtrack by drum n’bass master, Joey Davis. Joey has put together an awesome mix of break beat, trance and his signature dn’b that masterfully enhances every jump. Not only will you get to watch amazing jumping, but Frozen also features a bonus Learning section. Listen and learn as we talk you through many of the amazing skills and how we do them. These tricks may look like magic, but everything is real and you’ll learn how to do it. Frozen also features a full-length commentary with producer/jumper Peter Nestler. You’ll get the inside scoop on how we made this video look better than any previous jump rope movie. How we set up the smoke and water sequences and some of the problems encountered in doing so. Finally, there is a behind the scenes video that shows how Frozen was made. You’ll see the setups, some mistakes and how different everything looks in real time. As you watch things zip by at full-speed, you’ll appreciate the fluid look that high-speed filming brings to the table. It’s amazing…Frozen is a great movie – and it’s educational too. Unlike other jump rope films, Peter slows down the action dramatically to allow his viewers to see every nuance of motion within the tricks. Even for the seasoned viewer, it is difficult to appreciate the amazing technical detail and timing involved in jump rope skills…Frozen is a fresh treat for everyone. Non-jumpers, beginners, and seasoned experts will fall in love with Frozen. It’s very hard to put into words how much I love the video.